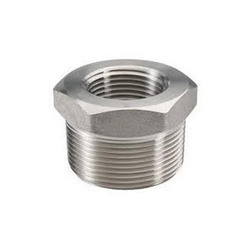 Providing you the best range of sockolets fittings, a105 forged fittings, threadolet fittings, plugs & bushing fittings and corrosion resistant metals with effective & timely delivery. 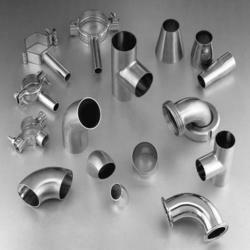 We are counted amongst the foremost manufacturers, exporters and traders of Sockolets Fittings to our clients. Our range is widely appreciated for their features like quality, optimum performance and durability. These provided according to the specifications mentioned by our clients. We check the quality of these testers on various parameters to offer defect free to our clients. ASTM / ASME SB 151 UNS NO. 70600, 71500, C 70600 ( CU -NI- 90/10), C 71500 ( CU -NI- 70/30), ASTM / ASME SB 152 UNS NO C 10100, C 10200, C 10300, C 10800, C 12000, C 12200. ASTM / ASME SA 182 F 304, 304L, 304H, 309H, 310H, 316, 316H, 316L, 316 LN, 317, 317L, 321, 321H, 347, 347 H.
ASTM / ASME A 182 GR F 5, F 9, F 11, F 12, F 22, F 91. 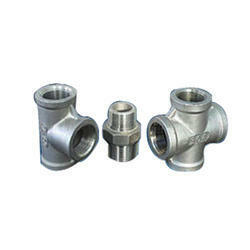 We are an acclaimed name engaged in offering our precious clients a superior quality range of A105 Forged Fittings that is used in different industrial fittings. This valve is manufactured using optimum grade raw material and sophisticated technology in synchronization with industry standards. In order to ensure quality, the entire range is rigorously tested on various parameters by our quality controllers. Keeping in mind the diverse requirements of our clients, we provide entire range of valve in various sizes and specifications and at affordable prices. We are instrumental in offering our clients a high quality range of Threadolet Fittings which can be used for isolating or regulating flow. The offered valves are meticulously tested on various quality parameters and are widely demanded in various industries. Provided valves are manufactured by utilizing optimum quality raw material and latest technology at our vendors end. In line with industry standard we provide the entire range of valves in various customized options and at affordable prices. Our in-depth knowledge and industrial expertise enable us to offer a distinguished range of Plugs and Bushing Fittings. Our vendors manufacture this product by making use of high-grade raw material and high-end technology so as to maintain the set industry standards. To make a flawless dispatch from our end, our offered range is rigorously inspected by our quality inspectors against various parameters. This product is broadly acknowledged by our clients for its easy installation and sturdiness. We are dedicatedly engaged in offering a commendable range of Corrosion Resistant Metals. Besides being manufactured from high-grade raw material and latest technology, the offered range is inspected properly by our vendor’s deft professionals. They are opened by the force of velocity pressure and closed by the force of gravity and back pressure. These valves are single direction flow and restrains flow in opposite direction. Offered valves are heavy duty, bolted cover, renewable seat ring, and body mounted disc swing type. Owing to features like durability and sturdiness, the offered range is exceptionally valued by our precious clients. The offered range is available with us in various sizes and shapes at affordable price.